In Crown Heights, Brooklyn, the Walt L. Shamel Community Garden sits on Dean Street in the neighborhood’s historic district, just east of an increasingly morphing, now heavily trafficked stretch of the nearby Franklin Avenue. A wave of new boutiques, bars, and even a Starbucks have opened in the area in recent years, an outgrowth of the dizzyingly rapid wave of gentrification that has flooded a lot of the city’s borough. While a recent gang feud that has driven up the percentage of gun violence incidents hearkens to Crown Heights’s rocky past, Manhattan-based real estate firms now chase residents and small business owners from their properties for a fast cash grab. Big investors get longtime rent-controlled tenants to move out so that companies can charge market value for space, and now, the average monthly rent for a one-bedroom apartment has soared into numbers that unfortunately better reflect what began to happen in corners of Brooklyn such as Park Slope and Greenpoint in the mid-2000s. When twenty new businesses opened up on Franklin Avenue in 2012, comics journalist Jess Ruliffson reported-out a story on a local institution that has only managed to evolve, even amid the frenzy. 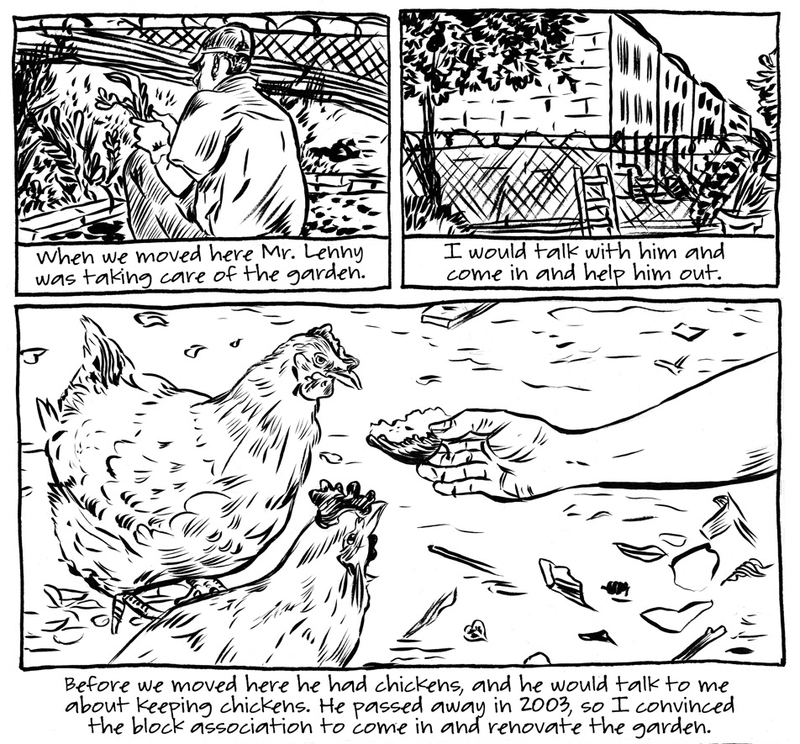 Initially included in 2010’s Digestate anthology from Birdcage Bottom Books, an urban community garden is the focus of a now-standalone slim work of graphic reportage from Jess Ruliffson called City Chickens. I know Ruliffson’s work best from her in-depth reporting on veterans who suffer from stress disorders after having returned from recent war zones in Afghanistan and Iraq. Built on intimate discussions that Ruliffson held with veterans about their struggles, a late 2013-era black & white award-winning minicomic called Invisible Wounds from publisher So What? Press is poignant and offers a sizable and rich portrait of her subjects, particularly given its brevity. The journalist and artist shifted her lens toward a different plane entirely for City Chickens, which examines a sort of microcosm of outdoor activity in a central Brooklyn, New York neighborhood. “I came to New York around Christmas 1985,” says Greg Anderson, one of Ruliffson’s subjects. “I had family here I wanted to get to know, plus I wanted to be an artist.” Anderson and his wife Deborah are the directors of the Walt L. Shamel Community Garden, where they engage neighborhood residents with workshops on crops, soil health, and taking care of chickens. As a kid in Selma, Alabama, Greg Anderson’s family kept chickens (whereas we get a tender moment or two with Deborah, who is now making up for the time she never had with chickens), but his interest in raising them in Brooklyn evolved from helping out with the garden in the mid-1980s, when the former gardner — Walt Shamel — kept fowl of his own. 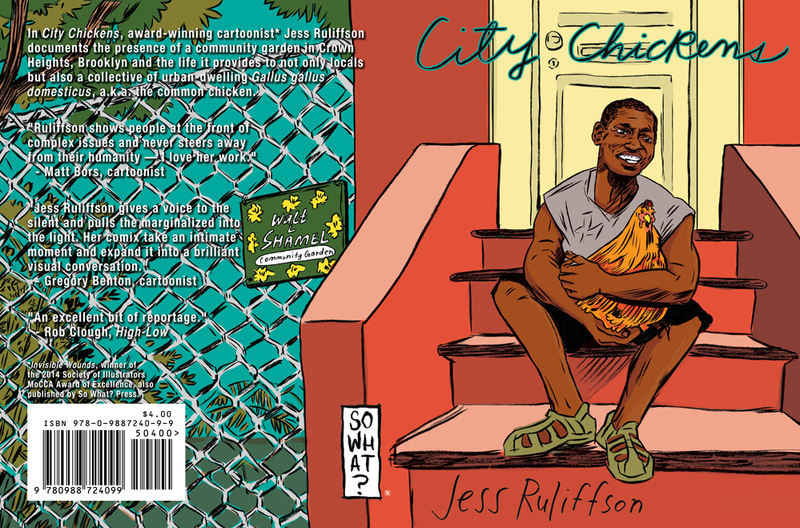 Ruliffson’s skill in portraiture is front and center in City Chickens. There is intricate detail in her linework for the reverent close-ups and brownstone building facades she employs over these ten pages, but when she zooms out, she produces sketchier strokes; facial features in a crowd are less defined. I like the silhouetted children figures slotted beneath a heavily detailed rooster illustration early-on that Ruliffson uses to depict Anderson’s youth, and there is clever exposition elsewhere — a horizontal positioning of panels re-imagine a 1980s-era structural fire during NYC’s crack epidemic, for example. The blaze destroyed a pair of buildings on the block, but ultimately yielded the space for the garden. City Chickens tells an interesting story but it’s also a profile of a worthy subject — a public garden bridges tradition and modernity; it’s a common area that when properly looked after can’t really lose its value as a part of the community, particularly in an ever-shifting neighborhood like Crown Heights. In full color and produced on big glossy paper stock, a new Kickstarter’ed print magazine of visual journalism out of the UK called Modern Times reaches into subjects both large- and smaller-scale as often as Ruliffson does, and features photography, a variety of illustration styles, text pieces, and more. Its editors intend to provide a platform “that gives people a voice,” with a mission that seems to align with the independent spirit that still defines some of America’s alt weekly papers. A reporting project in Modern Times takes Ruliffson back into covering the lives of soldiers. 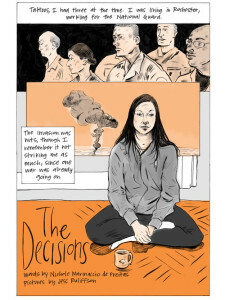 “The Decisions” — with additional reporting from Nichole Marinaccio de Frietas — is a quick, reflective four-pager that zeroes in on a soldier in the National Guard’s anxieties about the US government’s recent disastrous foreign policy moves. Diverse page layouts feature panel grids, free-standing illustrations, and a collage of both comic-styled narrative as well as portrait work. And like the spread from comics creator Isabel Greenberg here, “The Decisions” sees Ruliffson working in color, applying orange hues and ashy grey to her brief piece. “Graphic journalism is still viewed as ‘artsy,’ a medium that cannot provide a serious view of the world,” argue Modern Times founders Katherine Hearst and Fionnuala Doran in an ambitious editor’s letter. The staff — as well as freelance contributors like Ruliffson — will attempt to shift that perception in a blend of “drawings, words, and photographs as forms of reportage.” There are memoirs and reported pieces on gentrification and England’s homelessness, as well as comics and illustrations that take aim at social injustice. It packs an expansive lens, and although Modern Times isn’t without its debut-issue bumps — there is a need for aggressive copy editors, a focus on ensuring consistent leading from page to page, a more organized, cohesive aesthetic/built-out page design — the spotlighting of such a broad array of subjects here, especially in this manner, is worth a look. City Chickens images © 2014 Jess Ruliffson. Comic image from Modern Times © 2014 Jess Ruliffson.